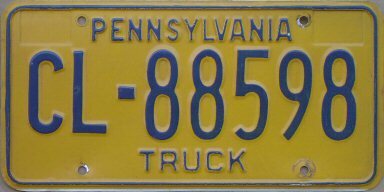 This page provides a narrative history, with accompanying photos, of various types of truck license plates issued by Pennsylvania from 1914 to the present day. January 29, 2019 – Upgraded my 1956 truck plate stamped with 1957 passenger dies. October 16, 2017 – Added both a photo and discussion of an unstickered current base truck plate with a state map outline in the upper left corner. 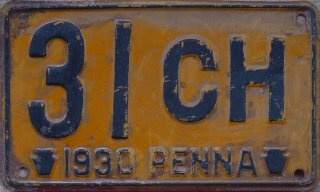 From 1906 to 1909, Pennsylvania license plates indicated that the driver, not the vehicle, was licensed, so there was only a single plate type during those years. Although dealer plates were introduced in 1910 (necessary because dealer plates by nature are not vehicle-specific, and during 1910-1919 the VIN number was otherwise enscribed on most plates), it wasn't until 1914 that common non-passenger plate types such as solid-tire or truck, trailer, and motorcycle were introduced. That's where this page begins. 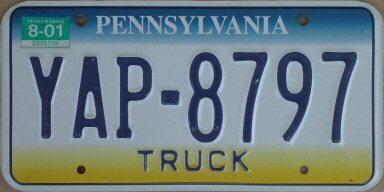 To the best of my knowledge, all non-government trucks registered in Pennsylvania, regardless of size, weight, ownership, or usage, have always been issued distinct truck plates since 1918. Of course, in some years, truck plates bore the legend Commercial, or had no legend at all, but they've always been distiguishable in some way from passenger car plates and other plate types. 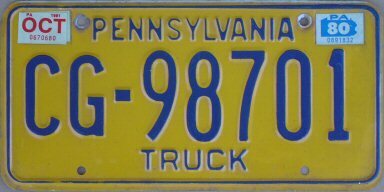 Except for a 10 year period from the late 1950s to late 1960s, Pennsylvania has never made a distinction between straight trucks and truck tractors (which pull semi-trailers); both have received the same plate types. Even during those 10 years, the differences between straight truck plates and truck tractor plates were pretty subtle; both carried the legend Truck. 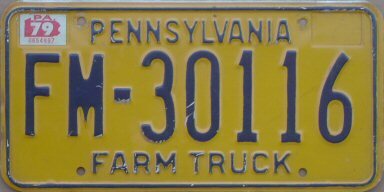 Pennsylvania Tractor plates were once issued to farm tractors that were driven on public roads. 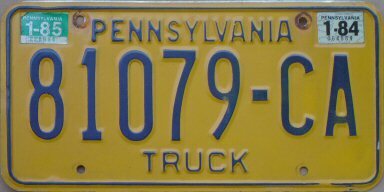 From 1906 until 1980, Pennsylvania truck plates and/or stickers nearly always indicated the registration year. However, beginning with plates dated 1941, the registration year no longer coincided with the calendar year. Plates dated from 1941 through 1957 showed the exact expiration date in addition to the registration year. Since 1981, stickers have indicated the expiration month and year. 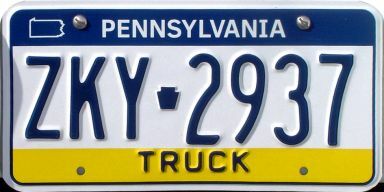 Generally, Pennsylvania truck plates have followed the same color scheme, dimensions, and other characteristics of passenger car plates. Because this information is covered in detail on the Pennsylvania passenger plate history pages, on this page I'll just point out when there were deviations from passenger car plates. My "Pictorial History" pages are intended to be a supplement to the information found in the ALPCA Archives. I am providing additional details and additional photos not found in the archives, and clarifying information when appropriate. When the ALPCA archives cover a subject in great detail, I do not repeat that detail here. I sincerely hope that you find this information useful. If you find an error or have additional information, or can provide a plate or a photo of a plate that I'm missing, please send me an e-mail. There's a link to my e-mail address at the bottom of every page. Please note that all plates shown that are credited to another person, or that are photos of plates in actual use, are plates that I am still seeking for my own collection. 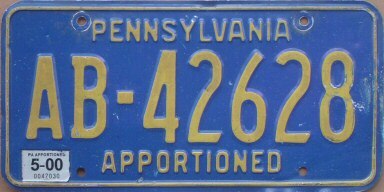 Specific plates for solid-tire vehicles were issued during the last two years that Pennsylvania made porcelain-coated license plates; these were similar in appearance to passenger car plates. The major difference was that the plates were wider in order to accommodate a column of small stars to the left of the state abbreviation Penna, the keystone tab, and the four-digit year. One to five stars were embossed on a vertical metal band that was affixed to the plate. The number of stars indicated the weight class of the vehicle, with five stars used for the heaviest trucks. I realize that these star plates are generally understood to be truck plates. However, a few other plate historians claim that they were in fact for solid-tire vehicles, and I have become inclined to agree. There is considerable overlap between solid-tire vehicles and trucks, however. Solid-tire vehicles had a brutal, bone-jarring ride, and so they were nearly always cargo vehicles (trucks), and only rarely passenger vehicles. However, I expect there were also lots of trucks back then equipped with pneumatic tires, which I presume continued to get the same plates as passenger cars with pnumatic tires. As was done on passenger car plates, a metal tab in the shape of a keystone was rivited to the plate; stamped on the tab were the words Not Transferable at the top and Makers Number [sic] at the bottom. Usually engraved on the center of the tab was the "maker's number", or the vehicle manufacturer's vehicle identification number, better known today as the VIN. A small number of plates have the word "SPECIAL" stamped onto the keystone tab instead of the VIN. It's not known exactly why this was done; possibly these keystones were used for vehicles that were either homemade or cobbled together from several vehicles, and so did not have a VIN. Today, what would seem to be 1914-1915 solid-tire plates are often seen with the band of stars missing. These plates can still be identified as solid-tire plates, or at least potential solid-tire plates, because of the blank space where the band would have been. In 1914, wider plates intended to be solid-tire plates were made approximately in serial block 20000 to 39999. Of the examples I've seen and recorded, only serials up to 24651 have the band of stars applied; serials 25047 and up do not have the band applied. In 1915, the wider plates were only made approximately in serial block 20000 to 29999. Serials up to 27791 have the band; serial 29110 does not. Apparently, 1914 being the first year issue for solid-tire plates, the state way over-estimated the number of plates needed. However, rather than let these plates go to waste, they ended up issuing the plates in the upper half of the 20000 series and entire 30000 series without the band of stars. The 1914 plate shown at right has a keystone with a VIN enscribed, and shows evidence of use. I presume these plates were issued to pneumatic-tire vehicles, mostly passenger cars. In 1915, they only made half as many potential solid-tire plates, and apparently registered significantly more such vehicles, but apparently still had a small quantity left over at the end of the year. Like passenger car plates, star plates from 1916-1919 were all-embossed, but were otherwise similar in appearance to the earlier porcelain plates. These plates again had the column of small stars to the left of the state abbreviation, the keystone, and the year, but now the stars were embossed directly onto the plate itself. Again, the number of stars indicated the weight class of the vehicle, with five stars used for the heaviest trucks. 1916 plates were embossed with the state abbreviation Penna and the four-digit year, above and below the keystone, respectively. During 1917-1919, star plates with short serial numbers also had the longer state abbreviation and full year, but on those with longer serials, the state abbreviation was shortened to just Pa, and only the last two digits of the year were indicated. The stars were on the right edge of the 1919 plates. 1916 star plates again always had all-numeric serials in the 20000 series. The 30000 series was used for passenger car plates in 1916. Since the stars now had to be stamped on the plates at the time of manufacture, issuing leftover solid-tire plates to passenger cars was no longer an option. 1917 to 1919 star plate serials always have prefix letters "C" or "S"; however, the meaning of these letters is not certain. It's been suggested by others that perhaps "S" stood for "solid tire" while "C" stood for "cushioned (pneumatic) tire". However, after seeing and recording details of numerous 1917-1919 Pennsylvania star plates, I've determined that this theory is clearly incorrect, because among the many examples I've come across, all 1917 star plates have the "S" serial prefix, while all 1918 and 1919 star plates were made with the "C" prefix. It's pretty apparent that a single letter was used for all star plates in a given year. Since the letter prefix distinguished the plate numbers from those of passenger cars, the numeric portion was not limited to a particular block of numbers, and presumably started at "1" each year. But, as noted above in the 1914-1915 section, some sources claim that the starred plates were actually issued to solid-tire vehicles, which were usually, but not necessarily trucks. On the other hand, the 1920-1923 truck plates bore the legend Commericial (meaning a vehicle configured for commercial use, in other words, a truck). I have come to the conclusion that the 1914 through 1917 star plates were in fact for solid-tire vehicles, hence the "S" prefix on the 1917 plates, while the 1918 and 1919 star plates were issued to commercial vehicles (trucks) regardless of tire type, hence the switch to the "C" prefix. Similar to passenger cars, the embossed keystone was enscribed with the VIN number of the vehicle; if the registration was transfered to another vehicle during the year, a silver-colored keystone was rivited to the plate with the new vehicle's VIN engraved on it. Similarly, if the new vehicle was of a different weight class than the original, a silver band with the appropriate weight class stars was attached to the plate over top of the embossed stars. It's also possible that these silver bands were used in instances where the DMV office ran out of plates in a given weight class. A small number of plates have the word "SPECIAL" enscribed onto the embossed keystone, or stamped onto the keystone tab, instead of the vehicle manufacturer's VIN number. It's not known exactly why this was done; possibly this designation was used for vehicles that were either homemade or cobbled together from several vehicles, and so did not have a VIN. 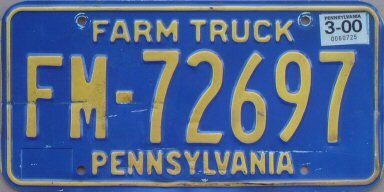 For the first four years of the 1920s, Pennsylvania truck plates were identified with the legend Commercial. There was no apparent way to identify the vehicle's weight class on these plates. Serials were again all-numeric. 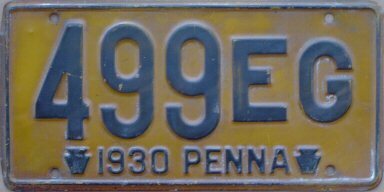 The three 1920 truck plates I've seen have all had Commercial along the top of the plate, with the abbreviation Penna and the year at the bottom. Each of these were taller than a passenger car plate to accommodate text both above and below the serial. I believe these plates are seven inches tall. The four-digit plate shown at left, and a five-digit plate in format 00-000, were both only wide enough to accommodate the serial. The third was a long plate with a six-digit serial in format 000-000. It's been reported that some 1920 truck plates were also made in the same style as was used in 1921 through 1923, but I can't confirm or refute this. I've seen various 1921, 1922, and 1923 truck plates, all of which had Penna Commercial 19yy (where 19yy indicates the actual year) running along the bottom of the plate, and were 16 inches wide regardless of serial length, in order for this text to fit on the plate. With no text at top, the plates were the standard 6 inch height. I've seen these with four-digit, five-digit, and six-digit serials. During these years there was no legend to identify truck plates. They were distinguishable from passenger car plates or other types of plates only by the single serial prefix letter, which on truck plates could be R, S, T, U, V, W, Y, or Z. (Letter X was reserved for dealer plates. Also note that TE prefix plates were issued to farm tractors, and TT prefix plates were issued to trailers. Other prefix letters indicated vehicle types other than trucks.) On truck plates, prefix letters were weight class codes, with "R" indicating the lightest weight class and "Z" indicating the heaviest. These truck weight class codes were used from 1924 through 1967, with the exception of 1930 and some 1931 plates. Truck plate serial letters were the same size as the numbers from 1924 through 1926. At least since 1927, and also possibly on late 1926 issues, serial letters have always been noticeably smaller than serial numbers. In 1924 and 1925, six character serials, and some five character serials, had a dash between the third and fourth characters from the right. Starting in 1926, five character serials consistently had a dash in this same location. I've only seen one example with four or fewer characters from these years, a 1929 four character U-class truck plate, which had no dash. 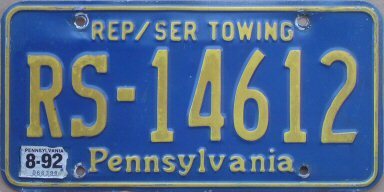 Pennsylvania plates with a letter "R" or "S" at the end of the serial number were also made during at least some of these years. The "R" suffix plates are much more common than the "S" suffix plates. I've seen two 1924 "R" suffix plates, several examples of 1925 plates, and one 1926 plate; another collector reports having a 1927 "R" suffix plate in his collection. One of the 1924 plates and one 1925 plate had three-digit serials in format 000-R; the others all had four-digit serials. The four-digit 1924 plate was in format 0000-R, while those in later years were in format 00-00R. The highest plate number I've encountered on any of these was a 1925 plate with serial number 90-87R. No one seems to know for certain the purpose or usage of these plates. It's been suggested by others that these were either replacement plates for motorists who lost their originals, or plates issued to vehicles rebuilt or reconstructed from multiple (presumably junked) vehicles. These speculations were apparently based solely on the suffix letter being "R". I'm convinced that these "R" suffix plates are actually R-class truck plates. I'm basing this on the assumption that the number of R-class registrations exceeded 99,999 during the years that "R" suffix plates were issued. I've held in my hands a 1925 Pennsylvania plate with serial number R99-935; the existence of this plate makes it a near-certainty that 1925 R-class truck registrations reached the 100,000 mark and beyond. When this happened, I'm sure they just flipped the letter "R" to the end and started a new numercial sequence. I've seen no plates other than "R" suffix plates that could have reasonably served as an overflow series for R-class trucks. "S" suffix plates are even more of a curiosity. The obvious, but perhaps incorrect answer is that they were used for trucks in weight class S after plate number S99-999. However, another plate historian has reported he's uncovered evidence that these were used to designate state-owned vehicles in 1924. The only "S" suffix plates known to exist are from 1924; the one I've seen a photo of had serial format 000-S. State-owned vehicles had the word Official stamped on them from 1926 forward. It's unknown how state-owned vehicle plates might have been designated in 1925. 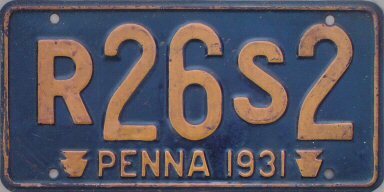 Beginning in 1930, for all types of plates, Pennyslvania tried hard to limit plate serial numbers to five characters or fewer in an apparant attempt to save money. This meant introducing new serial formats that had more letters and letters in a variety of positions. 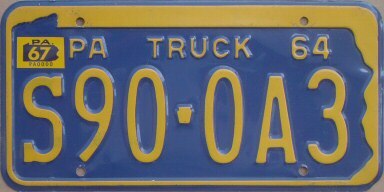 In the case of truck plates, they chose to use serial formats with two adjacent letters at the end of the plate, such as serial format 000xx, which was later used for passenger car plates starting in the late 1940s. Adding to the confusion, 1930 (and possibly 1931) plates in surch formats were the only truck plates from 1924 to 1967 where the first letter was not limited to the range R to Z. Also, truck plates and most other non-passenger plate types had no identifying legend during these years. 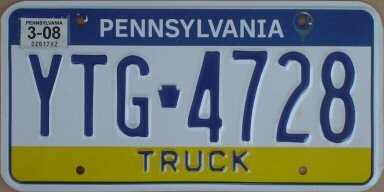 As a result of all of this, even to people familiar with old Pennsylvania license plates, all 1930 truck plates are easily mistaken for passenger car plates. Same thing with the 1931 plates with two letters at the end, whatever they are. In 1931, the state introduced some new truck serial formats that are more readily identified as such. Also in 1931, for the first time, different serial formats were issued to distinguish three-axle trucks from two-axle trucks. 1930 and 1931 plates with a single letter in the serial number (including letters R through Z), or with two letters, adjacent to each other at the beginning or middle of the serial number, are passenger car plates, farm tractor plates, trailer plates, or dealer plates, depending on the letter or letters and their positions. All 1930 truck plates had serial numbers with two letters at the end. This included both serial formats 00xx and 000xx. Based on the number of possible plates in each format, 000xx is the far more common of the two. I don't believe format 0xx was used for anything during these two years. In any case, the R to Z weight codes didn't apply in 1930; both the first and second letters could fall pretty much anywhere in the alphabet. By one account, first letters A through V were used for truck plates, while first letters X and Y in this format were used for dealer plates. First letters early in the alphabet indicated lighter weight trucks, and first letters later in the alphabet indicated heavier trucks. In 1931 the state resumed issuing truck plates with the first letter again R through Z but excluding X, and again positively identifying the weight class. To more readily distinguish them from passenger car plates, these R-to-Z two-axle truck plates also had one additional non-adjacent letter. However, the first letter, indicating the weight class, wasn't necessarily in the first serial position; as far as I know, 1931 is the only year where that is the case. I've seen photos of various 1931 truck plates with formats x000x, x00x0, x0x00, and 0x0x0. In theory at least, formats 0x00x and 00x0x could have also been used, but I haven't come across any yet. The 0x0x0 format plates I've seen have all been weight class R plates. Possibly, class R trucks used up all of whatever non-adjacent letter formats were in fact used, and then reverted to the 1930 format 000xx (and possibly also format 00xx), with the first letter once again in the early part of the alphabet. I've seen quite a few examples of 1931 000xx format plates, and all have either A or B as the first letter. Either that, or dealer plates continued to use this format in 1931, and went from using first letters X and Y in 1930, to the now freed-up first letters A and B in 1931. 1931 three-axle truck plates used the initial weight class letters R to W, Y, or Z, but they also had a second letter, always Z. The information I have is unclear about what position(s) the second letter was found, or whether there were only those two letters or also a third letter in the serial number. If 1931 three-axle truck plate formats were consistent with those of later years, then the second letter "Z" was always adjacent to the first letter, and there was also non-adjacent third letter elsewhere in the serial. Therefore, possible three-axle serial formats might include xZ00x, xZ0x0, and 0xZ0x. Or not; since 1931 two-axle truck plates had some quirky one-year-only serial formats, three-axle plates might have had some of their own. Again, during these years truck plates did not have any identifying legend. To distinguish from passenger car plates, and to avoid some of the limitations of the 1931 formats, 1932 and 1933 truck plates always consisted of six serial characters, and always were 15 inches long. Plates with an R through Z prefix with five or fewer total serial characters are passenger car plates, trailer plates, or dealer plates, depending on the letter. Six-character plates with prefix TE are farm tractor plates. In 1932 and 1933, the style and serial format of two-axle truck plates reverted back to that of six-character 1924-1929 truck plates, with a prefix letter R through Z but excluding X, and five numeric digits following, in serial format x00-000. Apparently, the numbers started at either 10-000 or 10-001 in each weight class. It's been reported that three-axle trucks again had a second letter "Z" in addition to the weight class letter, but with no further details; I presume the serial format for these would have been something like xZ0-000. For 1934, and continuing to the present, truck plates bore a legend that clearly identified them as such. The legend was yy#Truck#Pa in 1934, and # yy Truck Pa # from 1935 to 1937, with the # symbol indicating the position of embossed keystones, and the "yy" indicating the two-digit issue year. Serial formats reverted to patterns similar to those used in 1931, with a split alpha format. Again, the first letter was always R through Z excluding X, but this time the first letter was always in position 1. 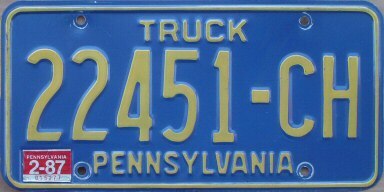 Although 1937 passenger car plates were issued with a state map outline, truck plates continued in the plain style for one additional year. The first serial character was always the weight class code, and there was always exactly one other letter. In 1934 for all weight classes, and 1935 through 1937 for weight classes T through Z, these plates had a total of five serial characters. In other words, serial formats were x000x, x00x0, and x0x00. During 1934, at least in the R- and S- classes, plates with the Truck legend were also issued in format xx000, which was otherwise considered to be a format reserved for passenger car plates. They're obviously not, thanks to the legend. Likely, they issued these after the other truck serial formats were all completely used up. Then, from 1935 through 1937, when R- and S- class plates exhausted the five-character split formats each year, longer six-character plates in format x00-00x were then issued. Again, truck plates with a second letter "Z" were issued to trucks with three axles. By 1936 at least, the second letter "Z" was definitely in the second position following the weight class code, and there was also a third, non-adjacent letter. In all likelihood these never exceeded five serial characters, and so serial formats definitely included xZ00x and possibly also included xZ0x0. 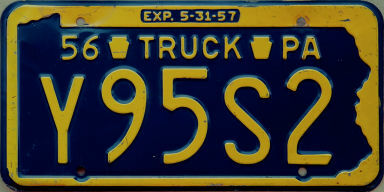 Starting in 1938, truck plates bore the state map outline that was introduced on passenger plates in 1937. Again, the first serial character was always a letter in the range R through Z excluding X, and indicated the weight class. The legend was yy#Truck#Pa, with # indicating the positions of embossed keystones. 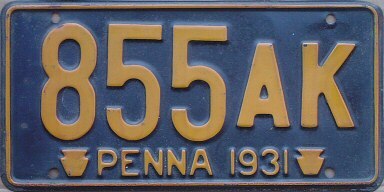 Like other plate types, the registration period was changed from the calendar year to end on March 31 of the year following the year indicated on the plate, beginning with the 1941 plate. Starting with this plate, the actual expiration date was added in very small characters along the top edge of the plate. 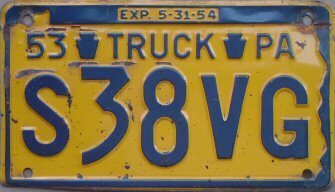 The expiration date of truck plates was changed again effective with the 1953 plates, to be May 31 of the year following the year indicated on the plate. Passenger cars continued with March 31 expiraiton dates. From 1938 to 1956, in order to limit the serial number to five characters, two-axle truck plates could now have two or three letters. Serial position 1 was always the weight class code, and position 2 was always a number. Therefore, serial formats used through 1956 include x000x, x00x0, x0x00, x00xx, x0xx0, and x0x0x, issued in that order. The 1956 plate shown at left is a version I had never seen documented and didn't know existed, until I found one for sale at the AACA antique car show in Hershey in 2010. That one was an R-series plate in the last of the various five-character serial formats. That one, like this Y-series plate in the second serial format, were late-year issues. They use the same thin-stroke serial dies also used on late-issue 1956 and five-character 1957 passenger car plates. I had no idea these dies were ever used on any non-passenger plate types. 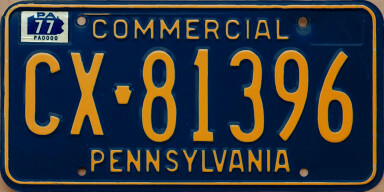 However, in 1956, all of the five-character truck formats were maxed out, and a six-character format x0000x made its reappearance, at least for weight class R. By 1956, Pennsylvania had brought its plates into conformance with the new North American 12 inch standard width, so they just couldn't make the plates longer to accommodate the sixth character like they did in the 1930s. Instead, they made the six-character 1956 plates with a third set of serial dies, which were narrow enough to allow for six serial characters. For 1957, two-axle truck plates were made only with six serial characters, using the same narrow dies introduced on late 1956 six-character plates. These same dies were also used on six-character 1957 passenger car plates as well as trailer, tractor, and possibly other plate types. In 1957, format x0000x was used for truck plates in all weight classes, and format x000x0 was also used for at least class R.
Again, truck plates with a letter "Z" adjacent to the weight class letter were issued to trucks with three axles. In all likelihood these never exceeded five serial characters, and so serial formats definitely included xZ00x and possibly also included xZ0x0. I haven't seen a 1957 three-axle truck plate, so I don't know whether they stuck with these five-character formats or went to a six-character format like they did for two-axle trucks. The 1952 plate shown at left indicates a May 31, 1953 expiration date. Yes, this is inconsistent with what I mentioned above, that the switch from March 31 to May 31 expirations began with the 1953 truck plates. I've seen plenty of 1952 two-axle truck plates with March 31 expiration dates, and I have no reason to think that three-axle plates moved to May 31 expirations any sooner than did two-axle trucks. Although this plate initially confused me, I later determined that it is one of a large batch of test plates that the Pennsylvania plate-stamping facility produced as they were preparing to change plate widths from 11 inches to 10 1/2 inches in mid-year 1952. They made all sorts of different plate types in the smaller size, using various numeric digits and variable serial letters, apparently to see whether the plates would look okay. Perhaps to also test the dies that would be used to stamp the May expiration date on the 1953 truck plates, the 1952 test truck plates were made with May expiration dates, rather than the March dates used on real 1952 truck plates. Other than the expiration date, though, this plate is correct in appearance. 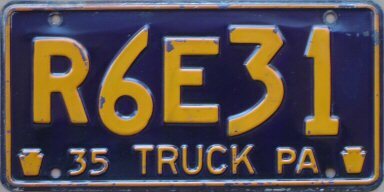 Multi-year truck base plates were issued in 1958 and again in 1964. Both of these base plates were yellow on blue, causing the truck color scheme to be opposite that of passenger cars from 1965 thorough 1967. All truck plate serial formats were now six characters, and the first character was always the weight class code R to W, Y, or Z. A keystone separator was introduced, located between the third and fourth serial characters. Several additional truck plate types besides just two-axle and three-axle varieties were issued during these years. These were identifed with specific letter codes in the second position of the serial number. Stamped along the top of these plates were Pa Truck 58 and Pa Truck 64, respectively. Early issue 1958 base plates had a tab slot next to the stamped year, which was never used since stickers were instead used to validate these plates in subsequent years. In the years that new base plates weren't issued, renewal stickers were applied in the upper left corner of the plate. Truck stickers were different colors than passenger car stickers. The exact expiration date was no longer indicated on the plate, nor on the sticker, but it continued to be May 31 of the follwing year for all types of trucks. The latest that one of these blue truck plates could be valid was May 31, 1968. These plates again always had a numeric digit adjacent to the weight class letter, and had one additional letter in the serial. Serial formats actually used include x00-00x, x00-0x0, and x00-x00, issued in that order, at least for the lighter weight classes. Heavier classes probably did not use all of these formats. Three-axle straight trucks again had the weight class letter in the first position and were specifically identified by the letter "Z" in the second position. The serial number also had a third letter not adjacent to the other two. As far as I know, the only format actually issued was xZ0-00x. This new category was probably limited to vehicles such as heavy dump trucks and cement mixers. These plates were identified with the letter "X" in the second position, but otherwise were similar to three-axle plates. Most likely, the only serial format was xX0-00x. Truck tractors aren't farm implements, but rather the front part of a tractor-trailer combination. 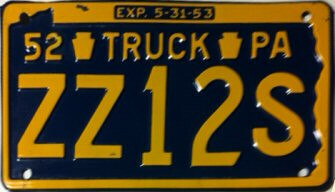 1958-1967 were the only years that truck tractors were issued plates distinct from straight trucks in Pennsylvania. These plates used the same weight class codes, but had the letter "T" in the second position, with a third non-adjacent letter in the serial. Probably the only serial format was xT0-00x. It's not clear from the information I have whether these plates were specifically for three-axle axle truck tractors, or for all truck tractors regardless of the number of axles. 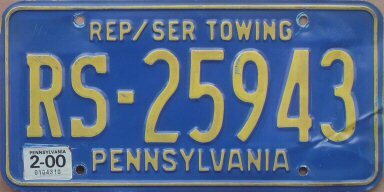 The multi-year truck base plates issued from 1968 to 1971 were blue on yellow, matching the 1965-1970 passenger car plate colors, and bore the legend Commercial along the top edge and the fully-spelled state name along the bottom edge. 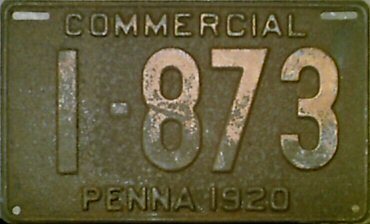 All trucks, and only trucks, were issued these "commerical" plates regardless of whether they were actually used for commercial purposes. Weight codes, axle codes, and distinct formats for truck tractors were abolished; the serial format for all trucks was Cx-00000. The plate again had a border in the shape of the state, more or less. The legend at the top necessitated redrawing the northern border of the state well into New York. These plates had a real sticker box with an embossed border in the lower left corner. Early issues of this base plate had a lightly debosssed "68" in the sticker box. The plate was used without stickers during the 1968 registration year; stickers were applied to validate the plate during the the 1969-1971 registration years. Sticker colors again differed from passenger car stickers. Expiration dates continued to be May 31 of the follwing year for all types of trucks. The latest that one of these yellow truck plates could be valid was May 31, 1972. Although weight class codes were no longer indicated on the plates themselves, the state continued to classify trucks according to weight. Sometime between 1968 and 1977, the state changed its truck weight class system; the alphabetic weight classes R through Z were replaced with numeric weight classes. These plates were introduced one year after and continued to be issued one year after the corresponding Bicentennial passenger car plates. 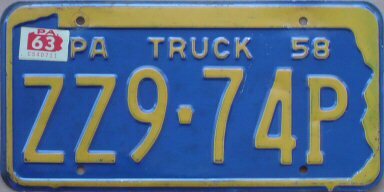 1972 to 1977 truck plates were yellow on blue, again always with Commercial at the top regardless of the actual usage of the truck. The state name was at the bottom, with sticker wells in both upper corners. The state map outline used continuously since 1938, which had become grotesquely distorted in 1968, was put out of its misery. Serial format Cx-00000 was again used, with a small keystone serial separator, for all trucks. Early issues had a lightly etched "72" in the left sticker well. The plate was used without stickers during the 1972 registration year; stickers were applied to validate the plate during the 1973-1977 registration years. Odd years had blue-on-white stickers; even years had red-on-white stickers (opposite from passenger cars). Sometime between 1968 and 1977, the state changed its truck weight class system; the alphabetic weight classes R through Z were replaced with numeric weight classes. Also, between 1972 and 1977, the expiration month for trucks in light-duty and medium-duty weight classes 1 through 8 was shifted from May to October, while trucks in heavy-duty weight classes 9 and higher retained their May expiration month. The weight cutoff between classes 8 and 9 is 26,000 pounds G.V.W. I don't know whether these changes occurred simultaneously, or at different points in time. Once this expiration month change was implemented, light and medium truck registrations expired on October 31 of the year indicated on the plate or sticker, while heavy truck registrations continued to expire on May 31 in the year following the year indicated on the plate or sticker. The last sticker that could be applied to the 1972 base plate was for the 1977 registration year, regardless of the truck's weight. Therefore, the latest one of these blue truck plates could be valid was October 31, 1977 for light and medium trucks, and May 31, 1978 for heavy trucks. 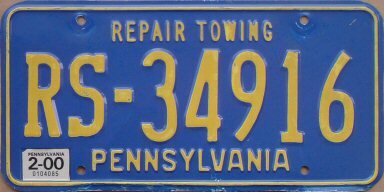 These blue-on-yellow plates were introduced about half a year after the corresponding Keystone State passenger car plates, and were issued starting in October 1977 to about early 1984 or so. It's entirely possible that apportioned and farm truck plates continued to be issued on this base beyond 1984. All of these could then be renewed through 2000 expiration dates. The state name was stamped at the top, between sticker wells located in the upper corners. Once again, several types of truck plates were issued; the specific plate type was stamped at the bottom of the plate. These plates were undated and were used during their first year without stickers. This first year was from October 1977 to October 1978 for light and medium trucks, and from May 1978 to May 1979 for heavy trucks. Red-on-white 1979 stickers (the same stickers used on passenger cars, which was a first) were valid through October 1979 for light trucks and through May 1980 for heavy trucks. 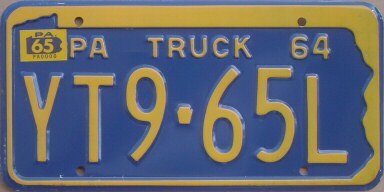 Unlike cars, at least existing truck registrations that were being renewed received a blue-on-white 1980 sticker, which did not indicate a month, and was of the same design as the 1979 and prior stickers. This 1980 sticker was only used on truck plates and probably some other types of non-passenger plates; in the case of trucks, this 1980 sticker expired October 31, 1980 for light trucks, or on May 31, 1981 for heavy trucks. After this, all trucks, except for apportioned trucks, received passenger car stickers that indicated the month and year of expiration. Details of the implementation of staggered truck registrations are addressed below. The Truck legend resumed after a ten year absense, and was embossed at the bottom of the plate. The serial format was once again Cx-00000 until this was exhausted in 1982; then serial format 00000-Cx was issued on this base until partway through the CD series. Unstickered plates used in 1978, 1979 stickered plates, and 1980 stickered plates cannot be distinguished between light and heavy truck usage, unless they also have subsequent month-year expiration stickers. May expiration stickers were only isused to heavy trucks over 26,000 pounds G.V.W., while expiration stickers for months other than May indicate a light or medium truck under this weight. Apportioned plates are issued to certain commercial vehicles that cross state lines. Apportioned truck plates have an Apportioned legend at the bottom, and serial format AA-00000. They were only issued in the AA series on this base. Apportioned plates in format BL-00000 were issued to buses. All apportioned plates expire annually each May, regardless of weight. 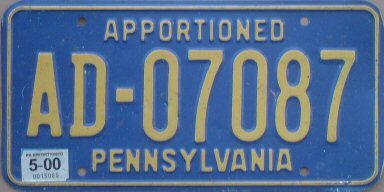 Pennsylvania entered the International Registration Plan (IRP) on June 1, 1983, so logically, the earliest stickers on apportioned plates should indicate a May 1984 expiration. However, I've seen Pennsylvania apportioned plates bearing May 1983 stickers, which I can't explain. Apportioned expiration stickers stickers say PA APPORTIONED at the top, rather than PENNSYLVANIA, but otherwise look like passenger car stickers. These have the legend Farm Truck at the bottom, and serial format FM-00000. 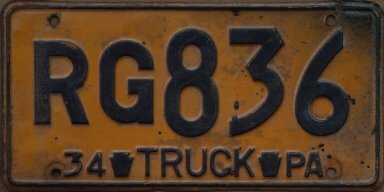 This was another new truck plate type introduced on this base, however, I don't know exactly when farm truck plates were first issued. I've seen a number of these with 1979 stickers, and I've even seen a couple of them with blue-on-white 1977 stickers on this base. I haven't yet come across any without stickers or with 1978 stickers, so I'm not completely sure what's going on. It's possible that farm truck plates made their debut in 1977 and were initially issued on the yellow base with 1977 truck stickers, but I'm not prepared to state that as fact. Passenger car plates came out on the yellow base in 1977, but without stickers during that first year. I don't know in what month farm truck plates expired prior to staggered registrations. Once staggered registrations were begun, farm truck plates could expire in various months, including May; I don't know whether May expirations are reserved for heavy farm trucks. Heavy trucks over 26,000 pounds G.V.W., did not convert to staggered registrations, and such vehicles renewing their registrations as well as subsequent newly registered vehicles retained their May expiraiton months. Heavy trucks renewing in May 1980 or newly registered through May 1981 were given blue-on-white "80" stickers that were of the same design as the "79" and earlier year stickers. These "80" stickers expired on May 31, 1981. Subsequently, heavy trucks were issued standard passenger car-style May expiration stickers each year, with the earliest being a blue-on-white "MAY" sticker with the year 1982 in very tiny characters in the upper right corner of the sticker. 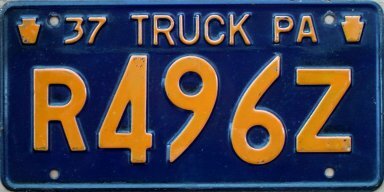 Apportioned truck plates were introduced after staggered truck registrations began, but they are not staggered and always expire annually each May. Existing registrations for light and medium trucks up to 26,000 pounds G.V.W. were also not staggered, but retained their October expiration month. 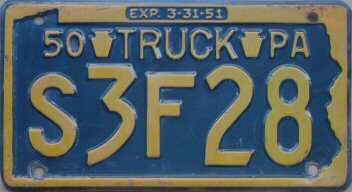 Such trucks renewing their registration in October 1979 were issued a blue-on-white "80" sticker, which was valid through October 31, 1980. Upon expiration of this "80" sticker, all light and medium trucks with existing registrations were then issued red-on-white "OCT" stickers, the same as were used on passenger cars. These stickers indicated the expiration year 1981 in very tiny numbers in the upper right corner. In subsequent years, light and medium trucks plates issued prior to staggered registrations continued to get renewal stickers indicating an October expiration. At some point, newly registered light and medium trucks began being registered for 12 inclusive months and were issued staggered passenger car month-year expiration stickers. I don't know precisely when this occurred, but the earliest it could have been was October 1979, with the earliest staggered expiration sticker being SEP 1980. Perhaps the latest it could have begun was in February 1980, since the earliest truly staggered expiration sticker I've come across on a truck plate was dated JAN 1981. In any case, an exception was made for light and medium trucks newly registered in June; these registrations are prorated and assigned an expiration month other than May, since May expirations continued to be reserved for heavy trucks. Yellow-on-blue base plates were issued from about late 1983 to June 2000 and could be renewed through June 2002. Therefore, probably the earliest expiraitons were in May 1984 for heavy trucks; and in late 1984 for light and medium trucks. It's entirely possible that apportioned and farm truck plates were not issued on this base until sometime later. These blue plates had a single sticker well in the lower left corner. Serial numbers continued in the same formats from the previous base. The Truck legend was moved to the top of the plate, and the state name to the bottom. Initial format 00000-Cx continued from the previous base, starting somewhere in the midst of the CD series, but in 1986 this format was discontinued well before it was exhausted, in the upper CJ series, for no apparent reason. Then, formats Yx-00000 followed by Zx-00000 were used. Truck plates were being issued toward the end of the Zx series when this base was discontinued in 2000. As far as I know, all heavy trucks (over 26,000 pounds G.V.W.) had May expiraitons, and all light and medium trucks expired in any month except May. Apportioned trucks continued with serial format Ax-00000, and were issued in the AB and AD series on this base. The AB series had the state name at top, and Apportioned at the bottom (the same as on the yellow base, and opposite from most other plate types on the blue base); with the AD series they brought this plate type in line with the others, and put Apportioned at the top and the state name at bottom. The AC series was skipped for reasons unknown. The Bx series of apportioned plates were issued to buses. The expiration month on apportioned plates is always May, regardless of vehicle weight. Apportioned truck expiration stickers are slightly different than standard May expiration stickers; they say PA APPORTIONED along the top edge, rather than PENNSYLVANIA. Also, I've seen a number of examples of apportioned plates on the blue base with May 2000 expirations (such as the two shown at left), but none any later. It would seem that these must have all been replaced with the tri-color base at one time, probably as they expired in May 2000, rather than being phased in over a two-year period as other plate types were. I don't know exactly when during the time this base was issued that this plate type was introduced. The legend Circus-Carnival Truck is embossed in mixed case letters at the top edge, while the state name is embossed in upper case letters at the bottom edge. Serial format is B/Z00000. The text Valid Apr 1 Thru Sept 30 is embossed on the left side of the plate. In addition to these embossed dates, a regular expiraiton sticker is also used to indicate the year; for obvious reasons, the expiration month indicated on the sticker is always September. Since the plate is only valid for six months each year, the registration fees are half that of full-year truck plates. The legend Farm Truck is embossed at the top; serial format FM-00000 continued from the previous base, starting at about FM-50000. Farm truck plates can expire in various months, including May; it's possible that May is reserved for heavy farm trucks. 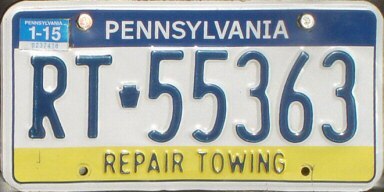 While these were seen on tow trucks, they are more correctly classified as a type of automotive business plate, similar to a dealer plate, rather than a type of truck plate. These plates were issued to vehicle repair and/or towing companies and were not assigned to a specific vehicle. The plates could be legally used either on vehicles owned by the business, or on unregistered customer-owned vehicles being test-driven or moved. There were several different versions of this plate made on the blue base. The legend was originally Rep/Ser Towing, but this was later simplified to just Repair Towing. Some versions used a mixed-case state name, while others had the usual upper-case state-name. Serial format was consistently RS-00000 on this base. Tri-color plates with blue and yellow bands that fade to white were first introduced in 1999 with 2000 expirations. 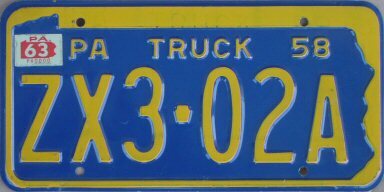 Tri-color plates with solid navy and yellow bands were introduced in 2005 for regular trucks, and later for other truck types, as existing stock of the earlier fade plates were used up. The original tri-color plate style continues to be used and renewed. Regular truck plates have the legend Truck embossed along the bottom. Serial formats Yxx-0000 and Zxx-0000 are both in use. As far as I know, all heavy truck (over 26,000 pounds G.V.W.) plates continue to have May expiraitons, and all light and medium truck plates expire in any month except May. Fade band plates were issued with prefixes YAA to YRR and had a dash separator; solid band plates introduced in 2005 started at prefix YSA and use a keystone separator. In 2011, prefix YZZ was reached, and the numbering continued into the Z-series begining with plate ZBA-0000. Pennsylvania stopped issuing expiration stickers at the beginning of 2017, and a few months later introduced a revised solid band base with a state map outline where the sticker well used to be. This applies to all plate types. Regular truck plates with the state map outline were first spotted in April 2017 and began at plate number ZKJ-0000. Without expiraiton stickers, plates issued to light and medium vs. heavy trucks can no longer be distinguished. The embosssed Apportioned was moved back to the bottom of the plate, while the serial format Ax-00000 continues from the previous base. AE and AF serial prefixes through AF-49999 were issued on the fade base with a dash separator. In the summer of 2007, apportioned truck plates began to be issued on the solid band base, with a keystone separator rather than a dash, beginning at serial AF-50000. BN series apportioned plates are issued to buses. All apportioned plates expire in May each year regardless of weight and, although you have to look closely to see it, have distinct stickers. 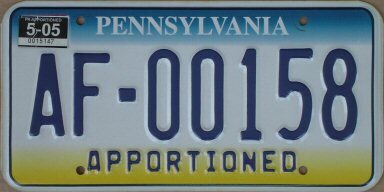 While normal May expiration stickers say PENNSYLVANIA across the top edge, stickers for apportioned plates say PA APPORTIONED. Circus-Carnival Truck is embossed in mixed case letters at the bottom edge; Valid Apr 1 Thru Sept 30 is again embossed on the left side. Serial format B/Z00000 and numbering continue from the previous base. Expiration month is always September. These have not yet been spotted on the solid band base as of November 2008. Farm Truck is embossed at the bottom, with new serial format FM-0000x. Serial numbers advance before the letter suffix. Farm truck plates can expire in various months, including May; it's possible that May is reserved for heavy farm trucks. No solid band plates yet for farm trucks, either, as of November 2008. 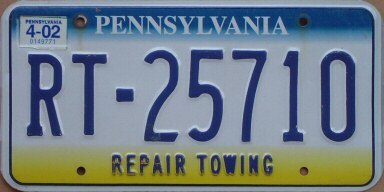 While these are seen on tow trucks, they are more correctly classified as a type of automotive business plate, similar to a dealer plate, rather than a type of truck plate. These plates are issued to vehicle repair and/or towing companies and are not assigned to a specific vehicle. The plates can be legally used either on vehicles owned by the business, or on unregistered customer-owned vehicles being test-driven or moved. Serial format is RT-00000 on both the fade base and the solid band base. Solid band plates began at about serial RT-49000. Well, 1978 truck plates were undated and unstickered, but they were renewed with stickers for 1979. 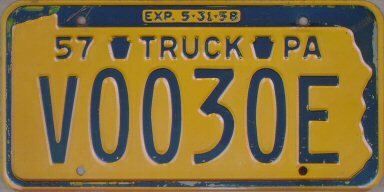 Other than that, Pennsylvania truck plates always either had the registration year stamped on the plate itself or were valid only with a sticker that identified either the registration year or the registration expiration date. That is, until 2017. However, unstickered 1978 and 2017-present truck plates are made on the standard bases appropriate for their respective time periods. First, a little background information. 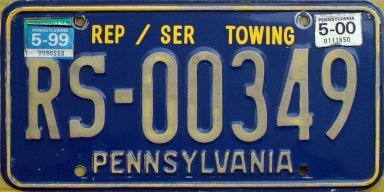 For many decades, Pennsylvania has used undated, unstickered plates bearing the legend Official Use on its state-owned vehicles. Since 1984, these plates have been colored reflective white on navy , and they've distinguished between state-owned passenger vehicles and non-passenger vehicles by issuing plates with different serial formats. State-owned passenger vehicles get plates with serial format 00000-PA, while state-owned trucks and other non-passenger vehicles have been issued plates first in serial format PA-00000, and since 2009, in serial format PA-0000x. Both formats remain in use. I consider these plates to be more government vehicle plates and not really truck plates. 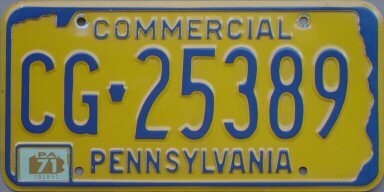 However, beginning sometime in 2010, Pennsylvania changed the legend on its state-owned non-passenger plates to read Commerical. This is rather baffling, as there is now no indication other than the "PA" serial prefix that these are government vehicle plates; in fact, the term "commercial" implies just the opposite, that the vehicle is being used for commercial purposes. Since these would seem to be commercial truck plates, I'm including them on this page. I think the state's intent was to identify that the plates are intended for non-passenger vehicles. 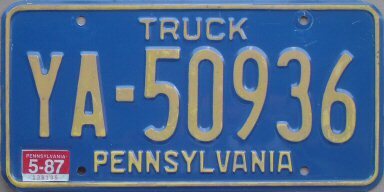 Before trucks became popular for personal use, they were often refered to as "commercial vehicles" regardless of their actual usage, hence the legend "Commercial" used on regular Pennsylvania truck plates from decades past. Today, however, the term "commercial vehicle" is taken more literally, and is commonly understood to mean a vehicle of any type used for commercial purposes. 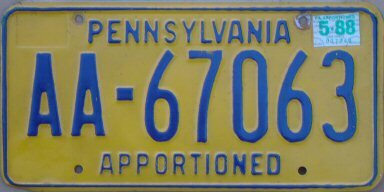 It would seem that Pennsylvania reconsidered its use of this confusing designation on its state-owned non-passenger vehicle plates, because in 2011, the legend Official Use resumed being used on newly issued plates of this type. Thanks to those who have directly contributed to the information on this page: Jeff Ellis, Ned Flynn, Clayton Moore, Kelly Brewer, Ed Burr, Nick Smith, and Randy Heishman. Moore, Brewer, Burr, and Heishman photos are presumed to be copyrighted by Clayton Moore, Kelly Brewer, Ed Burr, and Randy Heishman, respectively, and are used with permission. All text and photographs © copyright 2007-2017, 2019 by Rick Kretschmer, except where noted. All rights reserved.